Animal abuse and family violence are usually perceived and treated as separate issues, handled independently by animal care & control or human services agencies that until recently have had little incentive to work together. Professionals in all these fields are not surprised when they learn that often they are dealing with the same families, the same perpetrators, and the same overarching problems. Where animal abuse used to be trivialized by people saying, “It’s only a dog!” or “Boys will be boys!”, leaders now recognize that cruelty, abuse or neglect in any form should be taken seriously. Animal maltreatment is often “the tip of the iceberg” and the first warning sign of an individual or family in trouble. Knowing that these forms of family violence are linked, it is important that the agencies involved understand their role in communicating, collaborating, and reporting with each other. Violence towards humans or animals can take the form of physical, sexual or emotional abuse or neglect. While most animal cruelty investigations involve unintentional neglect, many uncover intentional neglect and abuse. All cases have the potential to be connected to other forms of violence or dysfunction in the home, and animal control officers and humane law investigators are often “first responders” and the first point of contact for a family in need of assistance. 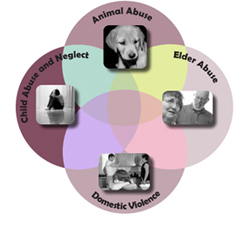 How are animal abuse and other family violence linked? In domestic violence, child abuse and elder abuse cases, actual or threatened animal abuse can be a way for the abuser to silence victims about the incident or to prevent them from leaving a violent relationship. Abusers kill, hurt or threaten animals to exert power over the human victims and to show them what could happen to them. Killing a family pet can eliminate a source of comfort and support for the human victim. Sometimes the victims themselves abuse animals, either to protect the animal from worse harm or to displace their hostility towards their abuser. Hoarding of excess numbers of animals, especially by elders, has been linked to a wide range of mental illnesses, illegal criminal activities, and public health and safety problems demanding the concerted, coordinated efforts of multiple municipal agencies. Dog fighting is an insidious problem that has been linked to guns, gangs, drugs, and gambling. Children are often exposed to this toxic environment, further desensitizing them to violence and drawing them away from the healing powers of empathy. Many elders try to provide loving care for their pets, but lack the financial resources, transportation, or physical capability to do so. As a result, either many companion animals suffer, or the animals are well-maintained but the person neglects her or his own well-being. The emotional impact upon impressionable children who witness or perpetrate acts of animal cruelty can be lifelong and devastating. Animal abuse is “the tip of the iceberg”: the way animals are regarded in a family is a window into interpersonal relationships and family dynamics. Investigators who find animal cruelty, abuse or neglect are rarely surprised to see other issues lurking beneath the surface. Animal abuse is part of an inter-generational cycle of violence. Children living in homes with domestic violence and animal abuse absorb unhealthy attitudes and family norms… and hand these values down to their own children when they grow up. Animal abuse is a form of power and control used to manipulate, intimidate, and retaliate against others in domestic violence. It is one part of the Duluth Model of Power and Control used widely in the domestic violence field. When animals are abused, people are at risk; when people are abused, animals are at risk. Increasing awareness of the link is encouraging legislators, community agencies, and caring people to take action by giving greater importance to suspected animal abuse, knowing that they may be also preventing other forms of violence.